August is a busy time of year in Prague as many tourists visit during the tail end of the city's high season when the weather is warmest. Prague tends to be drier in August than in June and July, with average high temperatures in the mid-70s and lows in the 50s. The summer months are the festival season in the Czech Republic, and August is no exception. In addition to Prague's many outdoor attractions, there are plenty of annual events both within the city and a short drive away. Visitors to Prague in August should expect to pay high season prices for plane tickets and hotel accommodations, although toward the end of the month prices may be slightly lower. The crowds won't be as large as they are in early summer, but wherever you go, make reservations or buy tickets at least a month ahead of your visit. Even with advance preparation, expect to spend at least part of your visit to Prague in August waiting in line. Though summer is relatively warm in Prague, always take a jacket or sweater in case a sudden downpour or cloudy weather makes the air feel chilly. Appropriate walking shoes should always be worn – heels or open toes are impractical for walking Prague's cobblestone pavements. 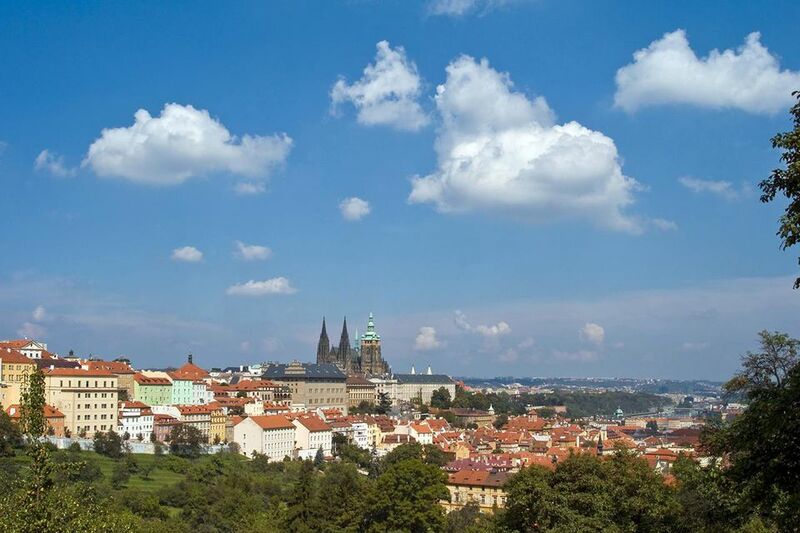 Prague Castle, which dates back to the 9th century, is a must-visit destination in the city. Currently the seat of the Head of State of the Czech Republic, Prague Castle's history is evident in the many styles of architecture visible in the structure. There are numerous music festivals in Prague in August, as it's a time of year well-suited for outdoor events. Prague's Festival of Italian Operas (formerly the Verdi Festival) begins in August and continues through September. It's held at the Prague State Opera house and as the name suggests, features performances of Italian operas. There's also the Prague International Organ Festival, which presents concerts by organists from around the world. It's held in the St. James Basilica in Prague's historic Old Town Square. About an hour outside of Prague is the Gothic Revival-style Sychrov Chateau, which hosts the Czech Republic's Highland Games every August. The festival celebrates the cultural heritage of Scotland with traditional bagpipe music and drumming, dancing and of course Scotch whiskey. For one of the numerous festivals that celebrate Czech culture, head to the town of Cheb, which holds Wallenstein Days every August, to honor Duke Albrecht von Wallenstein and his role in the Thirty Years War. In addition to reenactments of historic battle scenes, the Wallenstein Days festival features parades, fairytale performances, music, dance, and fireworks. Even though you'll be sharing the city with many other tourists, visiting Prague in August has much to offer and is worth the trip.